The motifs on this kimono illustrate the tale of Urashima Taro. Urashima was a fisherman who one day mistakenly caught a tortoise, which he kindly returned to the sea. The following day he saw a beautiful woman clinging to a wreck. The woman was Otomine, one of the princesses in the court of the Dragon King of the Sea. Otomine and Urashima were married and lived for three happy years in the Dragon King's realm until the fisherman began to feel homesick. Otomine begged him not to go and revealed that she was the tortoise he had rescued. Urashima was not dissuaded however, and he left taking a treasure box given by Otomine with the strict instructions that if he wanted to see her again he must not open the box. When he returned home, Urashima found all his family had died and even discovered his own grave. Frightened and puzzled he forgot his promise to Otomine and opened the box hoping for an explanation. He discovered that in the three years he had lived with his wife, three hundred years had passed in the real world. He was now a very old man and his spirit left him, leaving him lying dead on his own tomb. Kimono of red silk crêpe, resist dyed with designs in blue, dark-red and pale yellow on an orange ground. Details of the design are enhanced by embroidery in green, blue, pink, black and white silk and silk cord in satin stitches and with couched silver thread. The kimono is padded and lined with pale orange silk. At the bottom of the kimono are sea waves in which turtles appear. Above this is a rocky ashore on which stands a box beneath pine tree and prunus blossom. 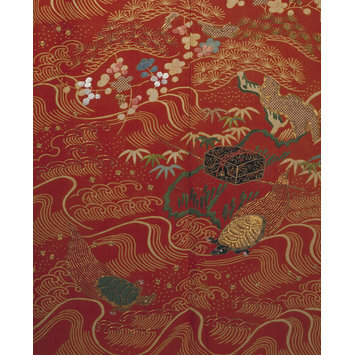 The upper part of the kimono patterned with bamboos and waves and with prunus blossom and flying cranes amidst clouds. These designs are worked on back and front of the kimono and the long hanging sleeves are patterned to match.